In preparation for the start of the 2018-19 academic term, here is some useful information about the September 2018 start of session and the arrangements in place to welcome new students. Enrolment of the 20000+ new students will be taking place from Wednesday 19 September to Friday 12 October in various locations within the Wilkins Building. Students who have opted, as part of pre-enrolment, to attend the International Student Orientation Programme (ISOP) will have selected an appointment during the ISOP week (19-22 September). All other students will have been allocated an appointment from 23 September. More information about pre-enrolment and enrolment is available on the New Students website. Opening times can be found here. As part of the ISOP week international students will be able to attend the 'We are Global' talks, enrol, collect their BRP, attend social events, and much more. More information can be found on the International Students webpages and on this article. Students staying in UCL Residences will be moving in over this weekend. International students attending ISOP will have been able to request to move in early. Enrolment activities will also be taking place on the main campus throughout the weekend. All students who have not enrolled as part of ISOP or the weekend will be enrolling during this week. Students will have received their enrolment appointment date and time in the confirmation of pre-enrolment email. Students are encouraged to enrol at these times to avoid queues and being sent away from the enrolment centres at busy times. During this week all new students should be attending a departmental induction to meet with their classmates, tutors and find out more about their course. Throughout the week there are also a range of Students' Union UCL activities, campus tours, library tours, and much more to assist students in their transition to UCL and settling in. The Students' Union will be putting on the Welcome Fair for new students to learn about all the Clubs & Societies, activities and opportunities available to them. On Monday 1 October to Wednesday 3 October students will be able to enrol in the Haldane Enrolment Centre. After this students will need to go to the Student Centre to complete their enrolment. As part of the continued improvements of the Start of Session activities the Student Support and Wellbeing team (SSW) have developed a number of Checklists for new students. These can also be helpful for tutors and departmental administrators to advise students and as part of the first few weeks to ensure that no student falls behind. 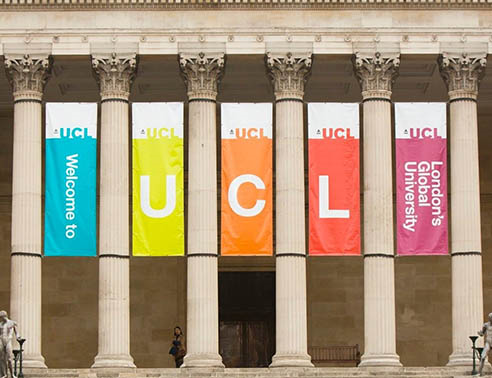 SSW have also developed a 'Welcome to UCL' App which allows students to create their own schedule for the first few days and find out more information about the support and opportunities available at UCL . The Countdown to UCL articles, which have been sent to students over the summer period are all available on the New Students webpages. They cover topics from how to stay safe, to settling in, to best places to eat nearby. All students should be encouraged to read through the information on the New Students webpages and if they are international also through the International Students webpages.